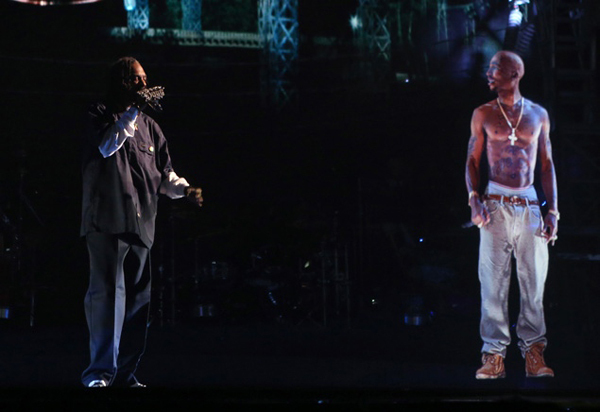 Tupac Back At Coachella In Hologram Form: The Next Wave Of Monetizing Dead Artists? Back from the dead and reunited on stage with Snoop for the first time since his 1996 death, Tupac was eerily resurrected this past weekend at the Coachella festival opening up a whole new world of opportunities to fans, concert promoters and the estates of the dead. Filed Under: Nation of Billions Tagged With: #FutureFrequency, 2d, 3D, artist, AV Concepts, coachella, concert, creative, Death Row Records, Digital Domain Media Group, Dr. Dre, event, experimental, future, gorillaz, hip hop, hologram, life extension, live, music, Musion Systems Ltd, Nick Smith, post human, RIP, shift, Snoop Dogg, special fx, technology, Transhumanism, Tupac, u.s.